peek >> << backEast end of tunnel, at 12th St., summer 2010. 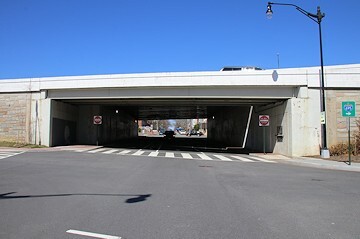 Opened in 1906, the Virginia Avenue Tunnel is now a major thoroughfare for east coast rail traffic, running beneath the street and just south of the Southeast Freeway for 10 blocks. 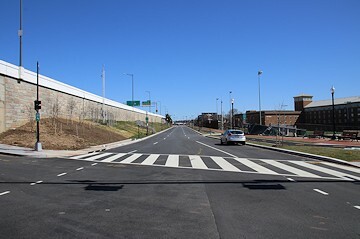 Construction began in spring 2015, and Virginia Avenue itself will be closed through 2018, although the cross streets remain mostly open to traffic and pedestrians, with periodic interruptions. June 1, 2017 - A hint of what construction looked like along Virginia Avenue beginning in spring 2015. 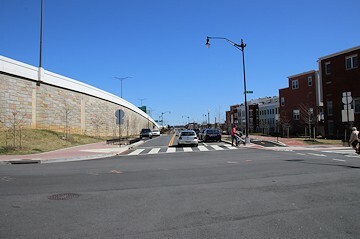 This is looking east (and downward) along Virginia Avenue at 3rd Street, after the new south tunnel had already been completed and the original (north) tunnel's existing walls demolished and new track bed laid. April 14, 2018 - This is also the 300 block of Virginia Avenue, not quite one year later, with tunnel work in this block completed and streetscape work underway. On June 13, 2014, the Final Environmental Impact Statement for the project was released. The chosen plan for construction out of a number of options is for new separate single track tunnel to be built, and the existing tunnel/track rehabilitated. Read the EIS for much more detail (about 450 pages more detail). July 19, 2010 - Looking eastward from the New Jersey Avenue overpass into the start of the tunnel at 2nd Street, with Garfield Park to the left and the now-closed horse stables to the right. The Southeast Freeway looms above. June 1, 2017 - A zoomed view of the same spot, showing the new south tunnel, completed in 2016 and now in use as the original tunnel at left has been demolished and is being rebuilt. A video produced by the tunnel team showing what Virginia Avenue will look like after construction is completed, including the new bike and pedestrian paths on the south side of the street. May 29, 2016 - The excavation for the second tunnel in the 300 block of Virginia, the block where private homes were within a few yards of the open trench. This tunnel was completed in 2016. Feb. 28, 2016 - The 200 block of Virginia Avenue, with infrastructure being put in place as a long portion of the old tunnel's southern wall is demolished. 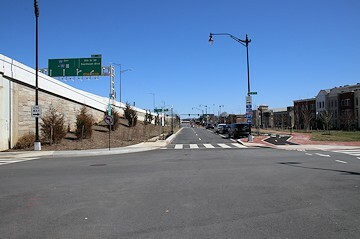 Feb. 28, 2016 - An example of the bridge decks built across Virginia Avenue at 3rd, 4th, 5th, 7th, and 8th Streets, to allow tunnel construction and traffic flow simultaneously. June 10, 2012 - Third and Virginia, where the work done on the sidewalks and lawn of the revamped 225 Virginia/200 I office building ending up being for naught. March 17, 2019 - The same location. August 1, 2010 - Third and Virginia, with the Capitol Quarter townhomes at right. March 23, 2019 - The same location. 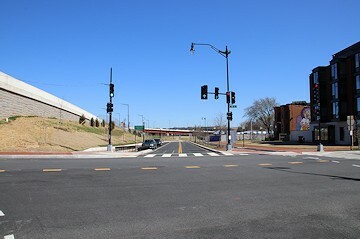 May 20, 2010 - Fourth at Virginia, with more townhouses to the right (set back farther than in the 300 block), and the 6th Street exit ramp from the freeway at left. The tunnel runs on a line a bit to the left of the street footprint, under the grass embankment, to match up with the footprint of the street east of 5th. 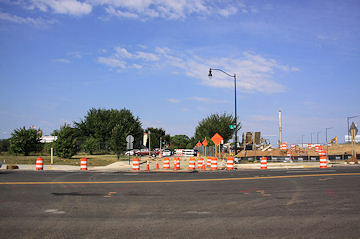 July 12, 2015 - Another view of the 4th and Virginia intersection, this time looking north. This street, with one-way traffic coming underneath the freeway from Capitol Hill, is a major north-south route into and out of the neighborhood. July 12, 2015 - The construction plan has brought about the closure of the little stub of I Street east of 4th and east of the alley on its south side. The "pocket park" in this location will be reconfigured once construction is completed, covering where I used to hook left to intersect with Virginia Avenue. Jan. 24, 2006 - A not-properly-positioned photo looking east on Virginia Avenue near its intersection with 5th Street, back when Capper Seniors #1 was under construction. March 23, 2019 - The same location, now a sea of construction barrels. Nov. 11, 2007 - The terribly exciting stretch of Virginia between 5th and 7th, running just north of the Marine Bachelor Enlisted Quarters. 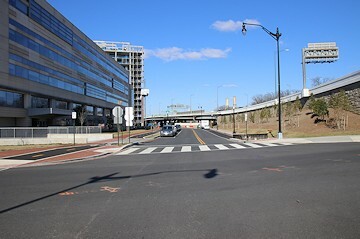 March 23, 2019 - The same location, showing the loss of the rightmost of the block's three lanes. March 9, 2014 - Eighth and Virginia. The 11th Street Bridges project gave CSX an assist by demolishing the on-ramp that was once here (where the dirt is now) and moving it slightly northward. March 23, 2019 - The same location, once again closed. Sept. 6, 2015 - Looking east on Virginia to its now-closed intersection with 9th Street, and getting a peek at the amount of space taken by the project from Virginia Avenue Park. July 12, 2015 - One casualty for the project's duration: the closure of the route to and from Garfield Park under the freeway (though the skateboarding area is still open [yay?]). 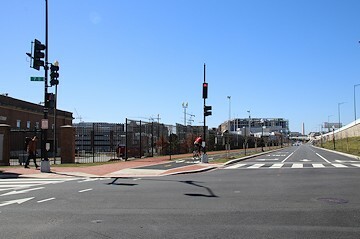 February 26, 2012 - Turning back and looking from Virginia Avenue Park at the iconic view westward along Virginia Avenue at 9th Street. February 26, 2012 - Back to where we started, looking at the tunnel embankment at 2nd Street a few years before the start of construction.